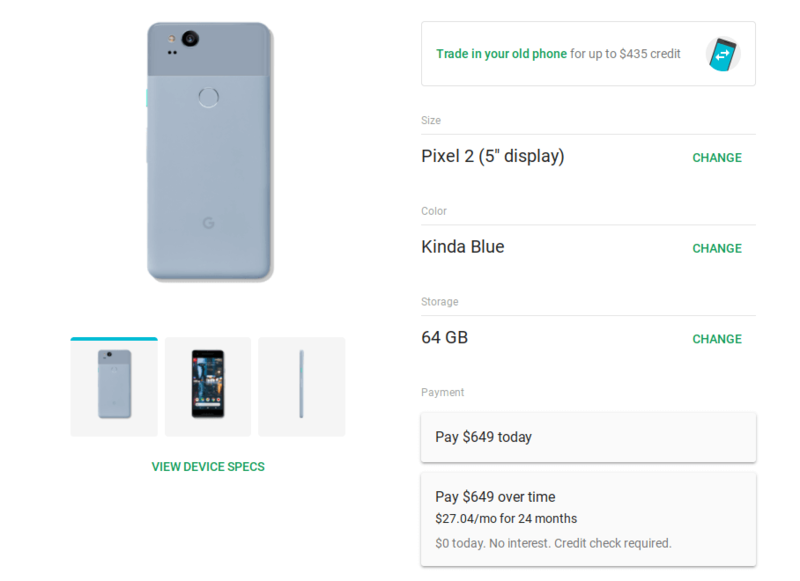 After being an exclusive to Verizon since October of last year, the Kinda Blue color option for the Google Pixel 2 is now available to everyone from Google or on Project Fi. The pricing of the phone and the functionality of the phone is identical to any Pixel 2, it is just that you have a more unique color option than Black or White. The Kinda Blue color was an exclusive for the phone from Verizon as being the other launch partner of the phone with Google. That meant that the phone was locked to the carrier like the other Pixel phones they have sold. Now with it being available from Google directly, you can get it unlocked. Pricing of the phone remains at $649 for the 5″ display phone with 64GB of storage. The 128GB model is not available in the new color so if you want it, it will only be available in the 64GBV variant. Remember that the Kinda Blue color is not available on the Pixel 2 XL. It is only on the smaller model. Checking the Project Fi site, which I’ve screenshot below, the phone is readily available for purchase. Currently the Google Store site for the phone is providing a lovely Error 500 (internal server error) so I can’t verify it is up and available there.